For decades, radical right-wing populism has been accompanied by a narrative warning of the fundamental threat these parties pose to liberal democracy. The effect has been close to zero. 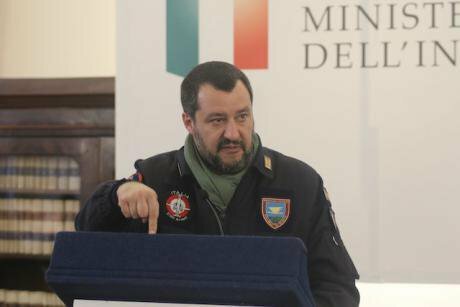 Matteo Salvini in Afragola, Italy, 18 January 2019. Esposito Salvatore/Press Association. All rights reserved. Populism is all the rage these days, particularly in Europe. Or, to put it more concretely, the lethal threat radical right-wing populism allegedly poses to liberal democracy. Authors who are usually quick (and justifiedly so) to zero in on the populist right's paranoid, conspiratorial take on the world, are equally quick to resort to hyperbole and hysteria, for instance by drawing parallels between today and the 1930s. Marx once remarked that history repeats itself, first as a tragedy, then as a farce. Journalists and other opinion makers would do well to remember this phrase before evoking the specter of Mussolini when reporting on the most recent provocations coming from the mouth of Matteo Salvini. The sensationalist rhetoric that informs much of the reporting on the contemporary radical populist right is largely fueled by the often outrageous rhetoric of radical right-wing populist actors. In the past, two of the most prominent champions of populist discourse in western Europe, the late Jörg Haider (FPÖ) and Umberto Bossi (Lega Nord), proved particularly apt in giving the media what they were craving – a catchy headline, particularly during the "silly season" (i.e., the summer months) when the media are desperate for anything to catch potential readers' attention. It was during that season that Bossi would threaten to "oil the Kalashnikovs" if "Rome" continued to refuse to embark on reforms (particularly fiscal federalism) demanded by the Lega Nord. The proof of the pudding, however, is in the eating. By now, a growing number of radical right-wing populist parties in western Europe have been given the opportunity to exercise real power as partners of center-right coalition governments, most recently in Norway and Finland. Gone are the days when there was a consensus among the establish parties, both left and right, to "quarantine" the radical populist right via a "cordon sanitaire." The recent accord after the election in Andalusia between the Partido Popular and Vox (characterized as right-wing extremist by the Spanish media), in exchange for Vox's outside support of a center-right minority government is the most recent example of the futility of this strategy. The adoption by the Danish traditional left of much of the Danish populist right's discourse on immigration is a clear indication that even the mainstream left is hardly immune to the logic of electoral arithmetic (why should only the center-right benefit from the electoral strength of the populist right?). Even the mainstream left is hardly immune to the logic of electoral arithmetic (why should only the center-right benefit from the electoral strength of the populist right?). Political parties have a certain obligation to their voters. They advance numerous demands, claims and promises during election campaigns and are expected to deliver on them once put in office. This applies particularly to the radical populist right, which, in their programs and manifestos, claim to lend voice to the expectations and aspirations of "ordinary people" -- provided the latter actually know what they want and desire. Surveys suggest that they do, and this not only with respect to immigration, but also with regard to growing socioeconomic inequality, the negative consequences of globalization, and the enormous challenges posed by digitalization and automation, particularly for low skill routine workers. Each of these phenomena and processes particularly affect ordinary people, i.e., the core constituency (aka the "base") of the radical populist right. Under the circumstances, it is more than justified to ask what these parties, particularly when in a position of power, have done for their voters. The answer is simple and contradicts much of what has been written about the contemporary radical populist right – not all that much. This holds even true with regard to the radical populist right's main area of "competence", immigration. The Lega Nord is a case in point: After promoting itself as an intransigent bulwark against "mass immigration," once in power (as a junior partner of Silvio Berlusconi) the Lega accepted the most extensive regularization of immigrants ever, caving in to demands of Italy's agricultural, industrial and service sector for cheap, docile labor. The situation has been similar elsewhere. In France, for instance, in 2017, the country's authorities granted more than 260,000 resident permits, an increase of almost 14 percent compared to 2016. And this despite pressure from one of western Europe's most successful radical right-wing populist parties. With respect to other policy fields, the radical populist right's "achievements" are even more dismal. Take, for instance, the question of social welfare, which should also be a central concern of these parties. Trade theory suggests that opening up to international competition invariably produces winners and losers. In order to secure the losers' support for open markets, governments need to compensate them in form of a strong social safety net. To be sure, prominent radical right-wing populist parties, such as Marine Le Pen's Rassemblement National (ex Front National), have gone to great lengths to promote themselves as the new guardians of the welfare state. The welfare state, however, depends for its survival on funds derived from taxes, particularly from those citizens who can most afford to pay them – the famous "one percent" on the very top of the income pyramid. It would seem appropriate to recall that the most significant early instances of populist mobilization in (quasi)democratic regimes – the American agrarian populists of the 1890s and the "Boulangists" in fin-de-siècle France – were to a significant extent on the left, their political doctrines largely suffused with a trenchant critique of the collusion between the political establishment and the hyper-rich devoid of any sense of social responsibility. In both cases (the same holds true for the "classical" period of populist mobilization in Latin America, such as aprismo in Peru and gaitanismo in Colombia) populism was all about restoring some measure of social justice at a time of flagrant inequality. At the same time, both movements were informed by a strong sense of nostalgia – in the American case, nostalgia for the Jeffersonian vision of a commonwealth of small, independent producers imbued with republican virtue; in the case of the left-wing Boulangists (such as Maurice Barrès), nostalgia for the days of the revolution, when the notions of liberté, égalité, fraternité still meant something. Contemporary radical right-wing populist parties are quite apt in evoking a sense of nostalgia – from the trente glorieuses in the case of Marine Le Pen to the conjuring up of the folkhemmet (the people's home) by the Sverigedemokraterna in Sweden. Today's radical right-wing populist parties have generally been championing lowering the tax burden, which predominantly benefits the rich. What they tend to leave out in their narrative, however, is that this period of post-war rapid economic growth and equally rapid rising living standards was also a period of a highly progressive taxation, designed to guarantee a measure of social equality. Against that, today's radical right-wing populist parties have generally been championing lowering the tax burden, which predominantly benefits the rich. A prominent example is Salvini's Lega, which made the introduction of a "flat tax" central to its campaign for last year's parliamentary election in Italy. Radical right-wing populist parties have largely got away with a political program that is long on rhetoric, but very short on concrete policies designed to help ordinary people. They have done this by promoting the very same symbolic politics for which they have (justifiedly) criticized the established parties: identitarian politics on the right (particularly with respect to Islam) against the identitarian politics of the left (such as gay marriage). Identitarian politics, however, does little to alleviate the very real material concerns and worries of ordinary people who face very real, and rapidly increasing, difficulties to make ends meet (which has been behind the eruption of "gilets jaunes" protest in France), Rapid technological change, whether in the form of digitalization or robotization, is only going to make things worse. Under the circumstances, radical right-wing populist parties, given their proven appeal to lower-class voters, have an obligation to represent the latter's concerns. In a position to deliver? Radical right-wing populist parties are certainly in a position to deliver, if only because of their significant blackmail potential. Until recently, they have used this potential to put pressure on the center-right to adopt their nativist (i.e., anti-immigrant) agenda. And the media have generally allowed them to get away with it by cultivating and perpetuating the notion that radical right-wing populist parties represent a fundamental threat to liberal democracy. So far nobody has asked why these parties, given their substantial appeal to lower-class voters, have failed to coax the established left to make a clean break with "third way" social-democratic neoliberalism and advance a genuinely left-wing alternative vision capable of mobilizing "ordinary" voters. The recent programmatic U-turn of the Danish Social Democrats with regard to immigration policy, which has brought them into line with the populist right-wing Danish People's Party, suggests that this might change. The social democrats' new course on immigration was the result of strategic calculations informed by the harsh realities of the new arithmetic of electoral politics: the fact that the radical populist right's largely unabated success at the polls has to a large extent come at the expense of the traditional left-wing parties, which, already severely weakened, are either faced with the threat of ending up permanently shut out of power (for instance in France and Italy, but potentially also in Austria and even Germany) or forced into having to make painful compromises if they want to govern (as most recently seen in Sweden). Under the circumstances, the Danish social democrats' immigration policy turn was to a large extent borne out of necessity rather than conviction. But it was also informed by the fact that the social democrats and the populist right share a number of positions, particularly with respect to social welfare – potentially common ground for cooperation. For ideological purists, who still believe in isolating and marginalizing the radical populist right via a cordon sanitaire, these developments must be disconcerting. For the rest of us, they should come as a welcome break with a policy which not only has failed, allowing the radical populist right to present themselves as victims, but has also has made it rather difficult to hold them accountable on behalf of their voters. Radical right-wing populism is not a new phenomenon in western Europe. They have been around for decades. As has been the dominant narrative in the media and among social analysts, who have incessantly warned of the fundamental threat these parties pose to liberal democracy. In the meantime, radical right-wing populist parties have been allowed to get away with empty bluster and claims… devoid of any sense of reality. The effect has been close to zero. In the meantime, radical right-wing populist parties have been allowed to get away with empty bluster and claims – such as the Front National's claim that once in power it would reduce immigration to virtually zero – devoid of any sense of reality. It is high time to embark on a new approach with respect to these parties. There clearly is a populist take on social, economic and foreign policy that responds to the anxieties and aspirations of ordinary people suffering from the negative impact of global economic and financial capitalism, unfair trade practices, ever increasing inequality, and rapid technological innovation. Political parties that derive a considerable share of their support at the polls from routine manual and service workers have an obligation to push for policies that improve their constituency's life chances. It is up to the media and professional analysts to expose the hollowness of radical right-wing populist programs and hold them accountable for delivering concrete results.